Windows 8's new Storage Spaces functionality will easily allow users and system administrators to pool different physical drives together into one logical drive, writes Rajeev Nagar on the Building Windows 8 blog. This functionality, which is similar in some ways to the now-discontinued Windows Home Server Drive Extender, will allow drives of any capacity connected to a PC by USB, SATA, or SAS interfaces to be seen by the OS as one large drive. 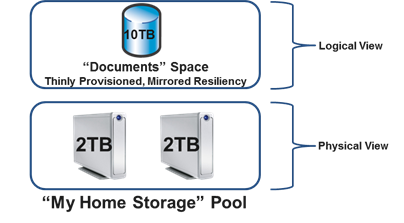 Once you've created a storage pool using two or more drives, you can then set up one or more "spaces" that will be seen by the operating system as a logical drive which can be formatted, partitioned, and used just as a physical disk would be. To provide redundancy, you can either apply the "mirrored" attribute to your pool, which makes sure that a copy of every file in the pool is stored on at least two different physical drives, or the "parity" attribute, which uses some drive space to store redundancy information - in the event of drive failure, this information is used to rebuild your pool and enforce mirroring. Microsoft notes that while the two redundancy options are similar, the "parity" attribute is best used for large sequential files or less-frequently-accessed content, since it has a higher random I/O overhead. When creating a new Storage Space, you can specify a maximum size larger than the amount of available physical space - the system will prompt you when the storage pool needs more drives to work with. Microsoft calls this "thin provisioning," which means that drive capacity is only reserved as you store data to the drive rather than all at once. You can also expand the maximum size of the Storage Space at a later point if necessary. Creation of these spaces can be scripted using PowerShell. For an in-depth look at how this technology works (and a FAQ which answers, among other questions, some inquiries about its similarities to and advantages over RAID), check out the full post using the link below. No, it's actually very different (and works parallel to what you can do in disk manager). Exactly. It's massively different and one of the best things about Win 8. From what i can see you get the performance of RAID-0 speeds, but you can also mirror your data 2 or 3 times. Plus if one disk in the Storage Space fails, it's no problem, you can add another disk easily, and in the meantime the Storage Space continues to work as normal. It also automatically copies any mirrored data that was lost on the failed drive over to the newly added drive without you having to do anything. You'll probably never have to worry about losing data ever again. Theres also an unlimited amount of drives you can add. Fragmentation isn't an issue either, no need to ever run diskcheck or defrag. It works with SSD's, HDD's, and either using USB, SATA, or SAS - any of this works in ANY combinations. Disks can be different sizes too. You can set an SSD in a pool as a backing device to improve performance (if you're also using it with mechanical HDD's). If a drive fails you get a notification, but you can also set it up to send you an automatic email (great for server admins). It's heavily integrated with the NTFS storage system. More so than Drive Extender. It makes Windows Home Server's 'Drive Extender' feature obsolete. + Many other things i cant be bothered to list. I think you better read a bit more about this. This is way more than what is available now with Windows. Sure you could span disks before, or do softwar RAID, but this is way more than that. Thin provisioning, RAID like features but with different size and speed disks, simple pool additions. Basically this is Windows Home Server Drive Extender done right. This is what they wanted to add to WHS 2011, but ran out of time. I had some major performance issues with Drive Extender when it would rebalance the drives. I am actually happier with WHS 2011 by a long ways. Actually, we can't. Windows does not currently allow multiple, physical storage devices to be used as 1 logical storage drive. Here's an example of what this technology would allow you to do. Let's say you have 1 partition your computer uses. We'll say the c:\ drive. If you run out of disk space, you would typically need to remove files or buy a different hard drive. If choosing the latter option, you would either need to image or reinstall Windows. With this new technology, you could purchase another hard drive and simply plug it into your computer. All of the physical storage devices could then be used as one logical c:\ drive. "Windows does not currently allow multiple, physical storage devices to be used as 1 logical storage drive." Actually, it does.. it just has a list of painful limitations and weaknesses. Windows server allows to to do semi-proper software raid(Using multiple physical disks as one logical volume), and the workstation version allows I believe, raid 0 or JBOD (IE, you run out of space on your C drive, add another drive, and 'extend' C onto it. The downside being that if either drive dies, windows can't access 'any' of the files on either (you can recover the ones on the non-dead drive with some easy tools, but windows will claim the volume is inaccessible).